Los Angeles is a sprawling metropolis that's impossible to see in a day, but you can visit its top attractions and suburbs on this full day of sightseeing that combines a morning tour of Santa Monica and Venice Beach with an afternoon tour through Hollywood and Beverly Hills. Leave the driving to an expert guide who will deal with the city's infamous traffic while you sit back and enjoy visits to the Third Street Promenade, Venice Beach Boardwalk, the Hollywood Walk of Fame, Sunset Boulevard, Rodeo Drive and more. Meet your guide in central Los Angeles to begin your full-day tour of the city's top attractions and suburbs by air-conditioned minivan. You’ll begin with a morning tour of LA beaches followed by an afternoon tour of the landmarks of Hollywood and Beverly Hills. Your first destination is the century-old Santa Monica Pier, which provides expansive views of the sandy coastline and the Pacific Ocean. Learn about the history of the amusement rides before taking a stroll along the Third Street Promenade, an open-air shopping district filled with boutiques and name-brand stores in downtown Santa Monica. Back aboard the minivan, drive to another waterfront favorite — the Venice Beach Boardwalk, birthplace of extreme skateboarding and a hotbed of counter-culture quirkiness. Enjoy people watching and soak up the bohemian vibe as you admire more ocean views and watch the many street performers. Your guide will regale you with stories about Venice’s former inhabitants like Jim Morrison while you take note of Muscle Beach's eccentric crowd. Next, take a 1-hour break for lunch (own expense) at The Grove shopping center next to LA's popular Farmers Market, and then start the afternoon portion of your tour. Learn about the entertainment industry en route to Hollywood, where you’ll set eyes on the Dolby Theatre (formerly known as the Kodak Theatre), home to the Academy Awards. Stop at the opulent TCL Chinese Theatre (formerly called Grauman’s Chinese Theatre) on the historic Hollywood Walk of Fame, where more than 2,500 stars line the sidewalk. Pass the 4,310-acre (1,740-hectare) Griffith Park and the restored movie palace of El Capitan Theatre, and enjoy views of the downtown skyline and the Hollywood Sign, a cultural icon marking the Hollywood Hills. As you drive down the Sunset Strip in West Hollywood, glimpse the Viper Room — a legendary nightclub — and the world-famous Whiskey a Go Go, former host to rock bands like Led Zeppelin and The Doors. Cruise past the notorious Chateau Marmont, a celebrity favorite, on Sunset Boulevard as you make your way to Beverly Hills. While you drive down the palm-lined avenues, your guide will point out the mansions of the rich and famous, as well as the legendary hotels they frequent like the Beverly Hilton, the Beverly Hills Hotel and the Beverly Wilshire, featured in the movie Pretty Woman. 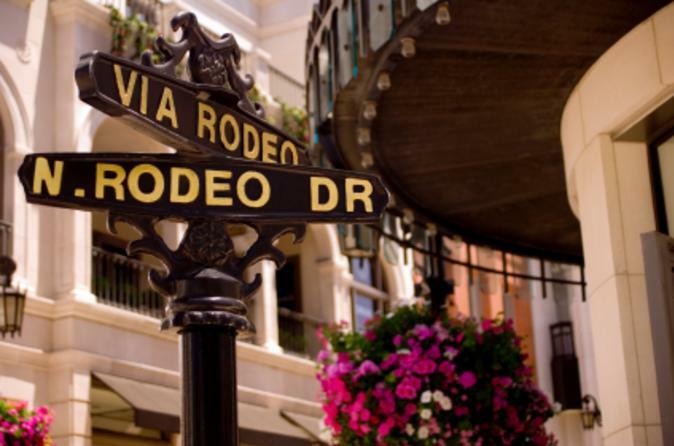 Then cruise down Rodeo Drive and past the designer stores of the Golden Triangle on Wilshire Boulevard. Your tour ends when you return to your starting point.